Xenith shoulder pads are designed for the committed athlete; lightweight and low profile allowing for a full range of motion without sacrificing protection. 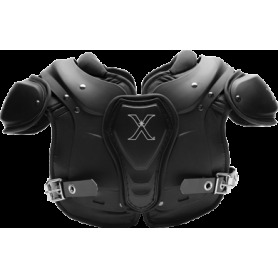 Introducing the latest in Xenith’s XFlexion shoulder pads – the XFlexion Velocity! The XFlexion Velocity is designed for, but not limited to, skill positions and features Aware Flow Shock Absorbers®, proven in Xenith football helmets. Xenith’s XFlexion shoulder pads offer BETTER PROTECTION and BETTER FLEXIBILITY for all players and all ages in a modern, aggressive & sleek design. Introducing the latest in Xenith’s XFlexion shoulder pads – the XFlexion Fly! The XFlexion Fly is designed for all positions at youth, middle school and intermediate levels and features Aware Flow Shock Absorbers®, proven in Xenith football helmets.